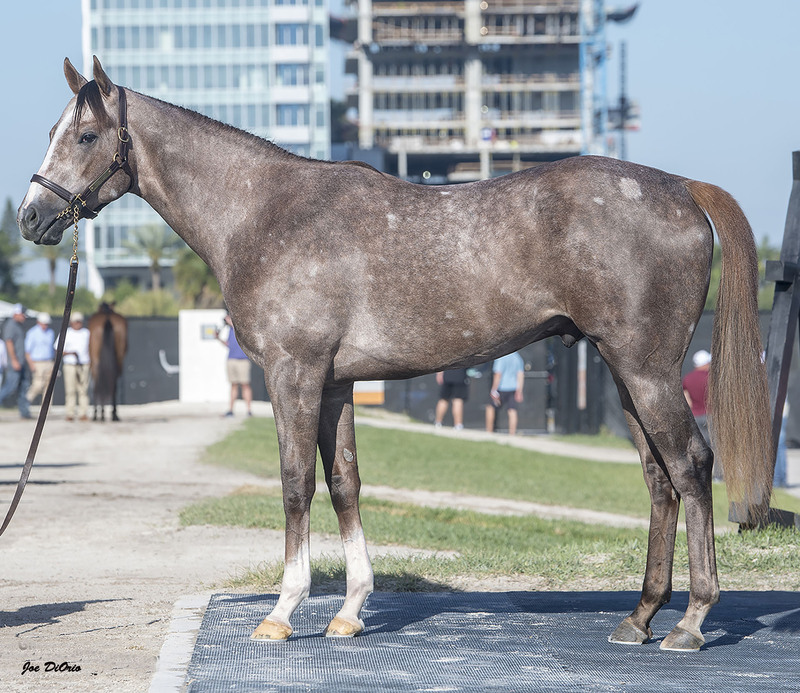 Fasig-Tipton’s Gulfstream Sale of selected two-year-olds in training is a fairly new addition to the elite sales circuit. Though the 2019 edition was just its fifth, graduates have already won Grade 1 affairs nationwide, including a pair of Florida Derbies, a Breeders’ Cup Juvenile, and the Kentucky Derby. Dr. Stephen Carr and Paula Parsons examined each colt at the competitive sale in order to land a uniquely impressive individuals. It is questionable if, during the first 20 years of the 21st century, North American racing has witnessed a greater runner than Ghostzapper. Horse of the Year and Champion Older Horse, Ghostzapper was a grade one winner from 6½ to 10 furlongs, his victories included the Vosburgh Stakes (G1), the Metropolitan Handicap (G1), the Woodward Stakes (G1), and the Breeders’ Cup Classic (G1), where he dominated from wire-to-wire to score by three lengths in record time. Ghostzapper’s sensational achievements as a racehorse have proved to be a prequel to an outstanding career as a sire. To date he is responsible for 66 stakes winners, including Champions Shaman Ghost, Judy the Beauty, Holy Helena, and Hunters Bay, as well as grade one winners Paulassilverling, Better Lucky, Contested, Molly Morgan, Moreno, Stately Victor, Starship Truffles, and Greenzapper. This spectacular son of Ghostzapper is out of a young mare with an exceptional pedigree. The dam, a daughter of the extremely successful sire Mr. Greeley, has produced two-year-old scorer Recoil and multiple winner Four Knights from her first two foals. Happy Now is out of Meghan’s Joy, a stakes performing daughter of the great A.P. Indy who has been a remarkable producer. This means that Happy Now is half-sister to no less than seven individual black-type performers. This talented septet include millionaire Ironicus, who captured the Bernard Baruch Handicap (G2) – which he took in course-record time – Dixie Stakes (G3), and Fort Marcy Stakes (G3): On Leave, a millionaire successful in six black-type events, including the Sands Point Stakes (G2) and My Charmer Stakes (G3); Norumbega, who triumphed in the Brooklyn Invitational Stakes (G2); Violet Stakes (G3) victress Quiet Harbor; and Hunting, who captured the Stuyvesant Stakes (G3). Happy Now is also a half-sister to the dam of Onus, heroine of the Commonwealth Oaks (G3). Happy Now’s granddam, Queen’s Wild, a daughter of the immortal champion Spectacular Bid, was a half-sister to the undefeated Futurity Stakes (G1) winner Eastern Echo; to Roar, a graded stakes winner and Champion Sire; and to graded stakes winner Blare of Trumpets. Queen’s Wild was also half-sister to Yell, a graded winner and stakes producer who also appears as granddam of the outstanding grade one winner Elate. The cross of A.P. Indy with Praise, a half-sister to Queen’s Wild, also produced two other close relatives to Meghan’s Joy in Congrats, a graded winner and Leading Freshman Sire, and Flatter, an outstanding sire, whose offspring include Champion Three-Year-Old Colt West Coast. The third dam of Happy Now is Wild Applause. A multiple graded stakes winning daughter of Northern Dancer, she was half-sister to grade one winner and sire Hero’s Honor and half-sister to Kentucky Derby (G1) victor Sea Hero. An exceptional individual by a great racehorse and outstanding sire, it’s clear this colt comes from a family that not only consistently produces top-class runners, but also conveys considerable appeal for a potential stallion. The total capitalization of the 2019 Hallandale LLC is $750,000 with all expenses paid through December 2019. Investments are available starting at a minimum of $37,500 for a 5% percent interest. Please contact us any time for more information or if you would like to be a part of his journey.